We got a late start this morning but it really didn't matter, we had a good day cycling. 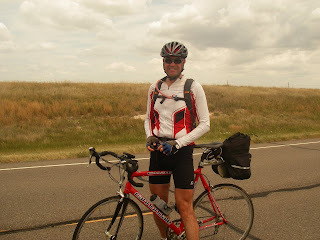 The winds were light, there was a light cloud cover keeping things cool, and we just spun along Hwy. 96. Mid morning or a little later we noticed a trailer pulled off the road ahead. As we drew near a young lady hailed us and let us know that she was setting up a snack break for a group of cyclists and offered us refreshment also. We accepted a crisp cold apple each with thanks. We continued to Dighton and stopped at a grocery for lunch makings which we took to the city park for our picnic. There was the same young lady, setting up lunch for her cyclists. This time we got to meet them all. They are a collage group riding to raise awareness for the world water crisis and to raise funds for water systems in poor countries. We left before them so they passed us a little while later. In the meanwhile we spoke with a rider going west, Eric from Quebec, who is riding the Trans-America route and then returning home on the Trans-Canadian Hwy. Eric is carrying the lightest load for such an ambitious trip! He's got just one change of clothes, camera, cell phone, and GPS. He is staying every night in motels and eating in resturants for every meal. This often means long days in the saddle when motels are far and few. In Ness City we met up again with Ray and Brenda and are camped with them in the Ness County Fairgrounds. Tomorrow they are going to take Jack and the trailer so we can put in some long days in order to have time to visit Ray's folks and old stomping grounds near Moundridge, Kansas. Come on you two, they can do 55 miles in ONE HOUR in the Tour de France! Just kidding, I am blown away by what you're accomplishing. Are you getting sick and tired, or is it still fun? When I read that you've passed 2,000 miles, I was moved to tears. Speaking of tears, be sure to watch the video of Kallista Pappas, the 14-year old girl doing the final workout at the Games (with the same weight I used on Sunday!) --it is on yesterday's WOD (7-8-08) on the main Crossfit site. Hey Mark, Yeah those Tour de France guys go fast.. but most of them don't weight as much as our panniers! lol. 2000 seems like a big number, but we got here in lots of little baby steps. Today we will do a little more, however, 66 miles to Larned. We'll be sure to check out that video. Take care! And another thing, no not sick and tired, well sometimes just plain tired, but the trip is still an adventure. There's something new every day, yes.. even on the Plains! We are having lots of fun. For a minute I thought that was a picture of Belinda! Had to do a double take. (No offense, Belinda - I needed my glasses! and in my defense, most of the pictures are of you...) First thing I noticed was those legs - now those are some muscles! Ha ha! We had fun at the cabin over the 4th! Daniel ended up coming with us. Really glad he did! Chucker loaned us his party boat for the day - very fun! Patty's on her way back up there now. Going to celebrate her 25th (choke) birthday on Saturday with a bunch of her (& Sam's) friends. I'm giving them till Sunday when I make my appearance. Whoa, Wichita County, eh?? You guys are pushing along now. Wishing I was anywhere but here right now, given the smoke from the Butte County fires (50,000 acres and counting), the heat (108 on Weds., cooler today because of the smoke) and the lack of cycling to work based on the poor air quality. I'll tell'ya, this summer's been the pits here!! Forge forth, keep on keepin' on and keep us informed. Also, say howdy to Ray and Brenda, eh?? Hi Leslie, glad to hear the youngsters are enjoying the cabin the way we did when we were their age. So glad you were able to get Daniel to go! It's been a long time since he has been able to go. Hey Bill, sounds bad in Sacto. We have had a pretty good thunder storm here. Met Ray's nephews today, Rodney looks just like his Dad, Les, only much taller. Ray and Brenda send there salutations back to ya.